One of the most recognisable views in Shiraz is that of the sun streaking through the stained glass windows of Nasir-ol-molk Mosque. Embarrassingly I only realised how time dependant that view was once I went to visit - we arrived at around 8:30am and by the end of our 25 minute stay it was already clear how small a window you would have in getting the desired aesthetic. The rest of the day was spent mopping up the remainder of Shiraz. This included the historical Qavam and Zinat Al-Molk houses, the Vakil Bazaar and enclosed mosque, a return visit to the Arg of Karim Khan and a stroll through the Eram Garden. We were done with Shiraz, so we headed back to the hotel for a brief chill (with Coup of course), before heading to the airport for an unplanned impromptu flight to... Mashhad. Mashhad was never on our itinerary, but it turned out to be important enough religiously for my travel companion to make the attempt to go. 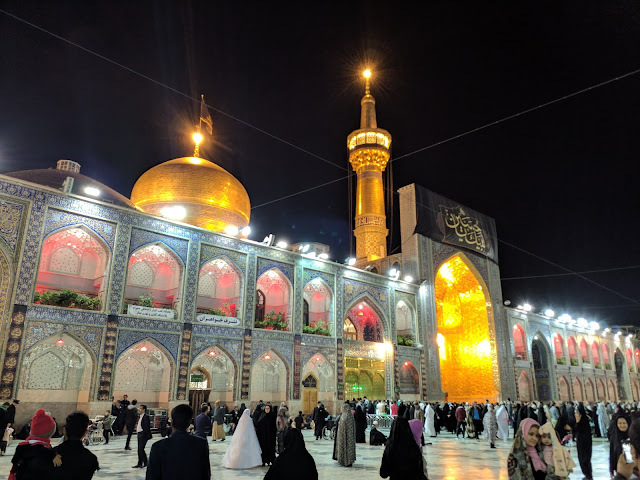 The plan would be to spend just the night there, so that he could complete a pilgrimage and since the logistics worked (internal flights are cheap and plentiful) it was a chance to see one of Iran's biggest points of interest that I wasn't about to pass up. I had also realised by this point that time seems to run slowly in Iran and it was possible to pack a lot in. In other words it didn't feel like we'd be missing out on any existing plans by creating the time to fly to the north west. That point of interest is, of course, the Imam Reza Shrine. To describe the shrine as big and impressive would be an understatement. The approach to the site reminded me of how the Haram in Makkah used to be before development - you could almost feel the spirituality as you walk there, and that even before you turn the corner to catch that first sight of one of the gates into the complex. And then once I was in, it was almost to the same scale and ambition as the two holiest sites in Saudi. While my friend performed his rites, I took the opportunity to explore the sprawling campus, getting lost a few times before I managed to map out the various wings and courtyards. Each passage opened up to a new mini world, each of which themselves channeled the various styles of architecture I had seen since my visit to Iran had started. The shrine itself was as charged and electric as you would imagine, with pilgrims continually paying their respects. It was easy to just get lost in the flow of people, and soon enough I became good at finding the shortcuts and viewpoints from which I could witness the devotion without getting in the way. It was easily worth the detour and we were crazy to not have included it in the first place.